It consists of a suite of business oriented ad-hoc queries and concurrent data modifications. 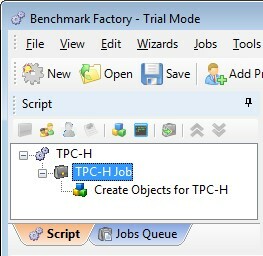 The TPC-H benchmark models the analysis end of the business environment where trends are computed and refined data are produced to support the making of sound business decisions. for queries and refresh functions. TPC-H does not represent the activity of any particular business segment, but rather any industry which must manage sell, or distribute a product worldwide (e.g., car rental, food distribution, parts, suppliers, etc.). The TPC believes that comparisons of TPC-H results measured against different database sizes are misleading and discourages such comparisons. The only benchmark results comparable to TPC-H are other TPC-H results compliant with the same revision. Benchmark results are highly dependent upon workload, specific application requirements, and systems design and implementation. Relative system performance will vary as a result of these and other factors. Therefore, TPC-H should not be used as a substitute for a specific customer application benchmarking when critical capacity planning and/or product evaluation decisions are contemplated. The physical clustering of records within the database is allowed as long as this clustering does not alter the logical independence of each table. Horizontal partitioning of base tables or auxiliary structures created by database directives is allowed. Groups of rows from a table or auxiliary structure may be assigned to different files, disks, or areas. may not rely on any knowledge of the data stored in the table except the minimum and maximum values of columns used for the partitioning field. For integer-based partition, the partitioning schemes must define each partition to accept an equal portion of the range between the minimum and maximum values of the partitioning column(s). For date-based partitions, it is permissible to partition into equally sized domains based upon an integer granularity of days, weeks, months, or years (e.g., 30 days, 4 weeks, 1 month, 1 year, etc.). For date-based partition granularities other than days, a partition boundary may extend beyond the minimum or maximum boundaries. and the query throughput when queries are submitted by multiple concurrent users. These queries have been given a realistic context, portraying the activity of a wholesale supplier. They contain query parameters that change across query executions. QGEN is a utility provided by the TPC to generate executable query text with substitution parameters. The substitution parameters are created randomly. If a tool is created instead of QGEN, the behavior of its seeds must be satisfied. Their purpose of the refresh function is to demonstrate the update functionality for the DBMS, while simultaneously assessing an appropriate performance cost to the maintenance of auxiliary data structures, such as secondary indices. The number/formula below each table name represents the cardinality (number of rows) of the table. Some are factored by SF, the Scale Factor, to obtain the chosen database size. The cardinality for the LINEITEM table is approximate. Identifier means that the column must be able to hold any key value generated for that column and be able to support at least 2,147,483,647 unique values; A common implementation of this datatype will be an integer. Integer: means that the column must be able to exactly represent integer values (i.e., values in increments of 1) in the range of at least -2,147,483,646 to 2,147,483,647. Fixed text, size N means that the column must be able to hold any string of characters of a fixed length of N. If the string it holds is shorter than N characters, then trailing spaces must be stored in the database or the database must automatically pad with spaces upon retrieval such that a CHAR_LENGTH() function will return N.
Variable text, size N means that the column must be able to hold any string of characters of a variable length with a maximum length of N.
Date is a value whose external representation can be expressed as YYYY-MM-DD, where all characters are numeric. A date must be able to express any day within at least 14 consecutive years. All the data type by column are defined in the documentation. A default SQL schema file dss.ddl is also available in the dbgen dir of the toolkit. The use of constraints is optional and limited to primary key, foreign key, check, and not null constraints. The NOT NULL attribute may be used for any column. Defining a primary key constraint can only be done for the columns listed. Columns listed as ‘Foreign Key’ may be defined as foreign key constraints. Check Constraints: Check constraints may be defined to restrict the database contents. In order to support evolutionary change, the check constraints must not rely on knowledge of the enumerated domains of each column. -g Produce debugging information in the operating system's native format (stabs, COFF, XCOFF, or DWARF 2). -a              -- use ANSI semantics. -c              -- retain comments found in template. -d              -- use default substitution values. -h              -- print this usage summary. -i <str>        -- use the contents of file <str> to begin a query. -l <str>        -- log parameters to <str>. -n <str>        -- connect to database <str>. -N              -- use default rowcounts and ignore :n directive. -o <str>        -- set the output file base path to <str>. -x              -- enable SET EXPLAIN in each query. GB stands for gigabyte, defined to be 2^30 bytes. By default, the generator use the b option and search the default file dists.dss. Try to use the -h operator. 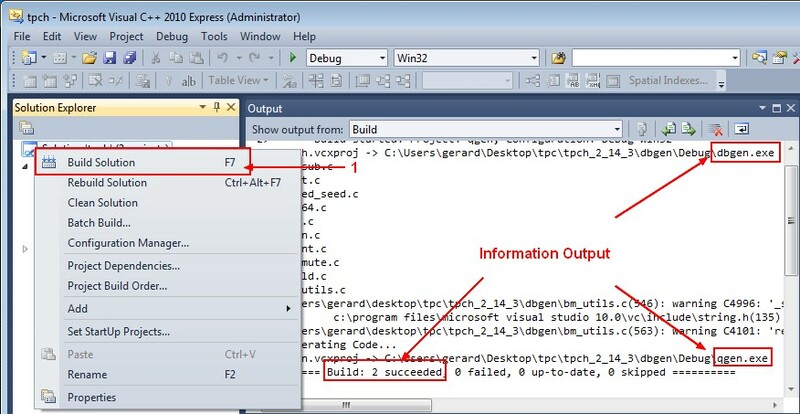 Right the Solution 'tpch'(2 projects) and choose the “Build Solution” option. TPC website: TPC-H is an ad-hoc, decision support benchmark.